Collect all the orders and reach 60000 points to complete the level. 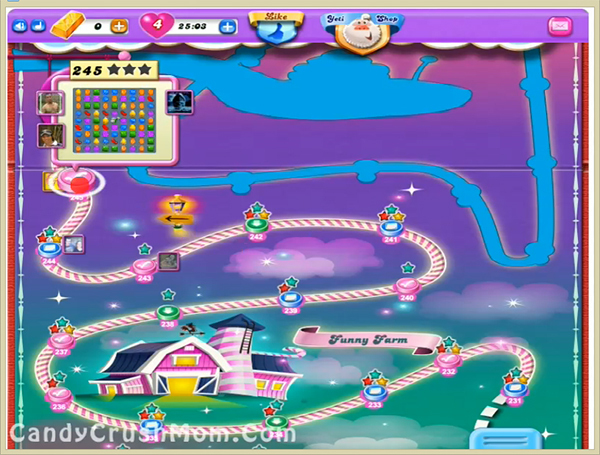 This level is hard as you need to make five striped candy with wrapped candy combo because if you try to make combo before they will break automatically or this combo could unbalance the Odus owl. For this level try to make lot of wrapped candies first and make combo with striped candy if you know it won unbalance the Odus owl. Play slowly as you have 40 moves and after moon struck try to make more combos to reach requirement. We completed this level with 468860 score using same strategy and reach requirement just before last move and got three star score at the end of the level.